Environmental pollutants include car and manufacturing emissions; chemical runoff into the water supply from oil spills and lawn care pesticides. But you DO have control over the pollutants inside your home. These chemicals (ammonia, chlorine, solvents), emit tiny molecules into the air (Volatile Organic Compounds – VOCs) that can irritate eyes, lungs and skin. Over time, accumulated exposure to these vapors can aggravate asthma and other chronic respiratory and skin conditions. Children and pets, indoor for much of the day and closer to the ground, are especially vulnerable. This is why R&R Time uses premium quality, biodegradable, natural cleaners – derived from fruit, vegetable and plant sources – and free of artificial dyes or perfumes. We deliver first rate cleaning power without harmful side effects … and we take it a step further – we add the power of aromatherapy to our cleaning products and your environment. Infused with fine essential oils, our products freshen the air with natural fragrances that act as mood enhancers for calm, clarity, energy or relaxation. 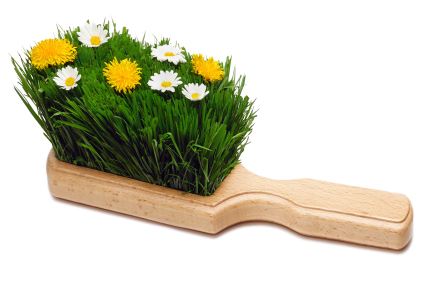 Learn about “aromatherapy” and enjoy a gift of fresh cut flowers every time we clean! The Perfect Gift – spoil yourself or spoil a loved one – R&R Time makes the perfect anniversary, birthday, thank you, shower gift. Great for Silent Auction Fundraisers, too! Extra tasks and seasonal cleaning projects? No problem. See what we can do.